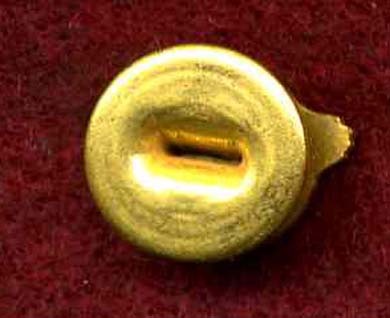 This is an Honorable Service insignia lapel button. It was made to be inserted in the button hole in the lapel of a suit or sport coat. This insignia is better known as the Ruptured Duck. The original cloth version was issued between September 1939 and December 1946 to all veterans who were to be honorably discharged. It was sewn on the right breast of the tunic, allowed its wearer to wear his or her uniform for up to thirty days subsequent to discharge. This indicated to the MPs that the wearer was not AWOL or Absent Without Leave when coming and going in their uniform. The lapel button was a way of displaying to those around you that you served in the military and were honorably discharged from the service. This while in civilian clothes. After all, you would not want to sew one of the cloth insignias on your best Sunday go to meeting suits!!! The term Ruptured Duck was coined by someone who thought the Eagle within the wreath looked more like a puffed up duck. This ruptured duck lapel button is in excellent shape. It measures approximately 1 3/4 inches (from wing tip to wing tip) by 1 1/4 inches.